Waltham made some unusual 21 Jewel Crescent Streets. Below you will find three of them. 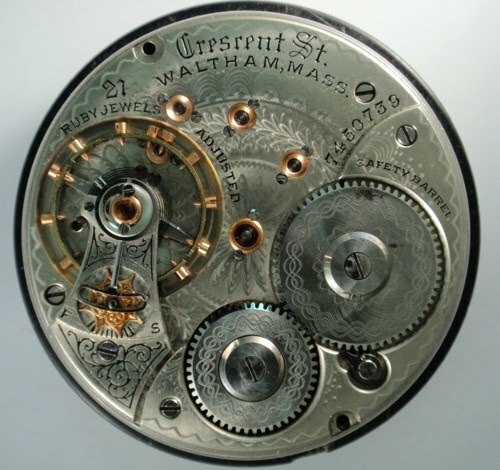 The example of the conversion dial is also found on Vanguard and 845 movements. 7450601-7451000 is listed in the Gray Book as a run of 21 Jewel Crescent Streets. One of these movements, 7450739, is marked "21 'Ruby' Jewels". 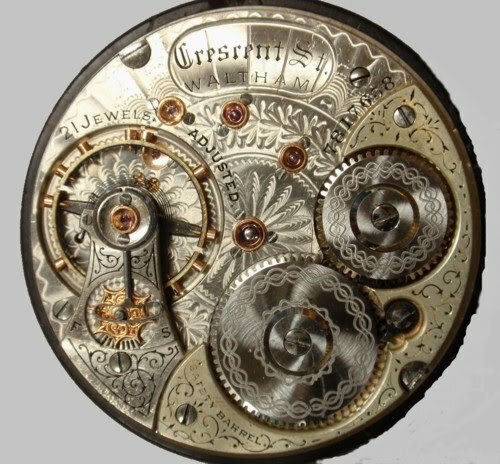 Four other movements have been reported from this run but there has been no indication that any of them have the "Ruby" marking. If you should have one and you are interested in participating in the database, please email jim@model92.com. Waltham made many movements for specific railroads. These are referred to by collectors as private label or contract movements. One of these railway systems was the Santa Fe Route. These movements are the Crescent Street grade that were marked "Santa Fe Route" and made with a gilt barrel bridge. They were made in both open face and hunting case movements and have been reported in 2 runs, 7817001-8000 (hunting) and 7902501-3000 (open face). The Gray Book lists the 7817001 run as being Crescent Streets and the 7902501 run as being "Specials". There have been 34 movements reported from the 7817001 run with three of them, 7817618, 7817622 and 7817631 being Santa Fe Route movements. Some of those movements were altered to be Crescent Streets, as in the photo to the right. The words "Santa Fe Route" were milled out and the words "Crescent St, Waltham) were inserted. Many of the movements carry the standard Crescent Street marking and production numbers would only be guesswork at the moment. The open face run, 7902501-3000, listed as "Specials" in the Gray Book, is broken down in the table below.